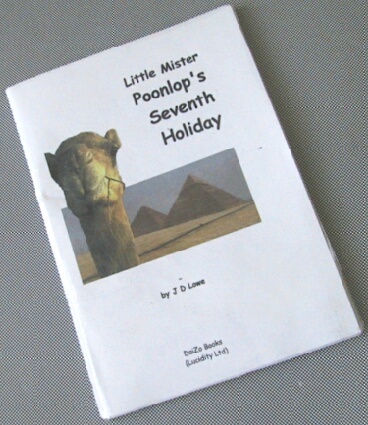 So, you want to read more of Mr Poonlop's story? Maybe you want to print a copy for yourself or your friends? on 27 sides of A4 paper, with no further kerfuffle. Like the author, this page is getting a bit long in the tooth. Most folks can download huge files in seconds now, and print double-sided in booklet form and all that snazzy stuff. as 4 booklets to fold and put between the covers. you can download a file specially to go on that (yay!). Just click the filename you prefer ~ or all of them, if you're feeling greedy. If you have the right sort of browser, right click and choose "Save Target As..." to download it. and fold 'em up into eighty pages of fun. (Full instructions are given on the front page, which you don't need to print. The file's about half a megabyte, by the way. You’ll need Adobe Reader or some equivalent software to read and print it. Don't worry though; it’s free, just click the name ~ if you haven’t got it yet or can’t work out how, just email me and I’ll help you out. You’ll need Mr Poonlop's password too. You’ll have to write to him for it. (Okay, that's a joke ~ the password is 'tohimforit'). Then you can print the cover. Click here for it, like you did for the book. This is another pdf file but you'll need to print it on a piece of white card which is 31x21cm, not just A4. That means you can have the title down the spine. Dead professional looking! If you can't get a piece of card that size, get a grown up to help you cut one out  but always make sure they aren't a homicidal maniac before you give them permission to use sharp tools. Any questions or comments can be sent to Mr Poonlop himself. And if you do, why not write and tell Mr Poonlop about it? And pass it on to your friends? In fact, why not go to his Little Home Page to see what's what?